Assault is a Main Story Quest in NieR: Automata. This quest is obtained after completing Machine Trade. "After you give viscous oil to Pascal, you hear a loud sound coming from the City Ruins. Command informs you that a large Goliath class machine is attacking. 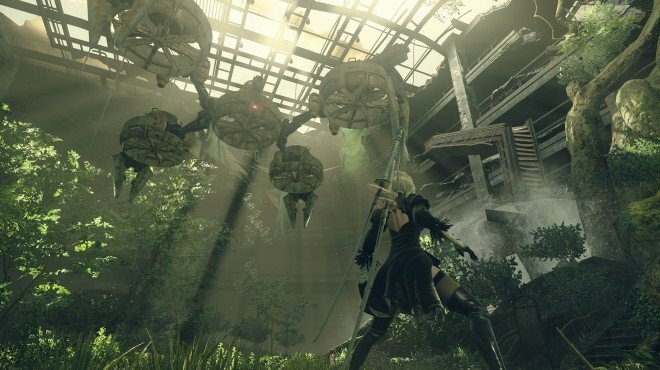 9S believes the Machines of the village set a trap, but there is no time for that now." After you finish exploring Machine Village, head to City Ruins and head to the marker on the map near the giant Goliath. You will need to go up a giant tree root and over a roof to get there. The marker is located at the top of a building near another Goliath which can be reached by going up the many staircases inside. Once there you will need to defeat the Goliath. You will be doing mostly range damage during this fight, so don't be afraid to use your Pod's charge attack as often as you can. Be sure to dodge when he swings both arms and tries to smush you. He is not overly difficult. After defeating him board the flight units nearby. You will then take on another Goliath machine in an arial battle. Be sure to dodge his arm swipe and missiles. After defeating it a cut-scene will play and you will be put back into the City Ruins. This completes this quest. There is a glitch we&apos;re the second machine trade is finished this mission starts, but it will give me ending h before I can even reach the city. Is there a form of fast travel I am missing? You can also destroy the Goliaths on foot, receiving some extra rewards.